We offer simple trapping and removal of the offending animals as well as full home exclusion and prevention services. With the exclusion and prevention service, once we have effectively removed all the nuisance wildlife, we go over every possible potential entry point and seal them. The entry points are reinforced and the work is guaranteed for 5 years. If wildlife enter the home where we've reinforced and sealed, we will return at no extra charge. Keep unwanted animals out of your home and businesses. 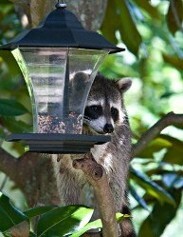 These include squirrels, raccoons, birds, bats and opossums. They frequently make their homes in your attics or crawl space. Squirrels will chew at your wires in your attic. Raccoons will nest in your chimney and attic, leaving nasty piles of droppings. Opossums will nest in crawl spaces, tearing down insulation and leaving droppings on the vapor barrier. When you contact us, our staff will head out to your location and determine what kind of wildlife problems you have. Once we identify the problem, we employ the best removal method and set up traps to properly and humanely remove the animals. This service can take anywhere from several days to more than a week. Contact us in Raleigh, North Carolina, for more details on our effective wildlife removal services.